The end of cold hands! Your product handwarmers are just perfect. It can be easily recomended to anyone who has difficulties with suffering from cold. I have been able to take photos even in -20°C temperature with these handwarmers and Heat3 gloves. Excellent help that keeps you going. Mostly, they are warm ca. 8 hours, not more. But they are very good. A little bit slow in the start. Last year the product was better - more heat! We are very pleased with the function of your product, handwarmers, they keeps us warm during the winter/ski period of 5 month! I was going to Svalbard, -15 degrees and permafrost. Used handvarmers and did not have cold fingers. Super easy to use and all worth the money. Utroligt hvor stor en forskel produkterne giver i kold vejr. Die Handwärmer nehmen wir zum Trockentauchen her. halten ungefähr bis zum ende des Tauchgang warm. Funktionieren sehr gut - beim Skifahren genutzt. These hand warmers performed excellent in the Arctic. Only thing is you might need multiple for fast and constant heating if hands are removed from gloves often. Taking the gloves off and on to help the kids is really tough in cold weather - the fingers just dont like it. A hand warmer in each glove saves the days and gives your fingers a chance to thaw. If you put (close tide) them in plastic bag after using them only for few hours, you can use them again for the rest of the time. 12 hours is assured! Lately I have purchased a pack of handwarmer , as a new product. I am really satisfied with it, especially while cycling. Congratulations . Kind regards and success in the future. De handwarmers werken erg goed. Ze blijven ontzettend lang warm. Ik gebruik ze in mijn wanten op koude dagen. Zeker met skiën zijn ze ideaal. Ze gaan de hele dag mee. great product , kept our hands warm the whole day at -25 degree. Such a great invention to fit nicely and without causing any discomfort. Keep you warm and lasts long enough! These warmers last all day. The warmers last even longer than 12 hours, and are generally better than those I bought from an English company. Used my hand warmer a cooled day skiing. It was warm and nice all day long. Amazing how long the warmth is holding, 12 hours is thrue! The warmth is nice temperature, not too hot! easy to use! good product! After a day of cold hands at -10°C skiing in the Alpes a sportshop advised me to use the heat packs from Heat company. Next day i could stay the whole day skiing, even in the evening i used then to walk outside. My circulation in one hand is very bad, so your warmers are in use all the time. I`m very pleased with them. Long lasting heat, not as hot as reusable heaters, but very comfortable for long term wearing. Lately in Holland it was snowing, and I tested the hand warmers on one of my bicycle night rides. I have big hands and the warmers seemed small but after a bit of fiddling they settled nicely on my palms and heated up quicker than expected. Very good. There is pressure on the handlebar of course but the thickness was not a problem and felt very comfortable after a while. Have not tried to place them on top of my hands yet, but that seems a good option too. Back home I put them in a closed bag and indeed the reaction stopped, ready for later use. Very good invention. With the bags for me it's history that I have cold hands, I'll buy them again. One hand is badly affected by MS and is constantly cold. With the handwarmers I can now have a warm hand all day. I have MS which badly affects one hand. I used to get terrible chilblains on every finger of that hand until I started to use a hand warmer every day. So far this year, in spite of the very cold weather, I`m chilblain free. Wo die sind ist es warm! Top! They do their job very well in the cold! The WHOLE day warm hands! I used them in my gloves on the outside of my fingers. After a day of photographing just below zero still warm hands to make pictures. This is now standard equipment in my backpack. Fast delivery and professional stuff. a perfect help against cold hands in the winter by playing golf. The product corresponds 100% my expectations. Very very good. The handwarmer last over 10 hours. I m very pleased with my choice. Excellent for down the allotment! Keeps hands warm for most of the day - brilliant. It means you can go out in all weathers. We haven't found anything else that works as well or for as long as Heat Company warmers. A little less hotter than the footwarmer but oke. very good to keep you warm. stays warm for 12 hours and fits perfectly under the gloves. was delivered on time also. I use heaters for more then 6 years and I am satisfied with the product. I use sealing bag if the heaters are not complety used up in one day. In hermetically sealed bag the heates can stand for two weeks until I need them again. Warm for 12 h. Fantastic! Ordered 10 warmers, they arrived quickly and packaged well. I will definitely be shopping here again! Wonderful product thank you so much its perfect for me! 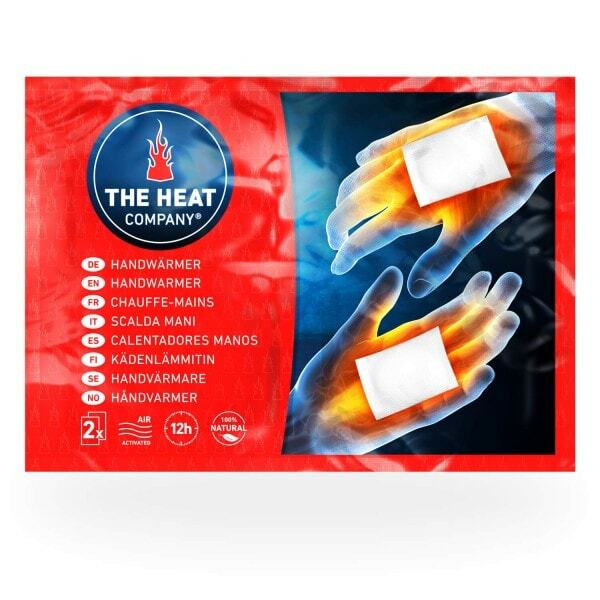 The hand warmers are excellent in both functionality and value, The Heat Company have always provided excellent and efficient service. I use handwarmers while riding my scooter from home to office and back. This product has a good quality and definitely helps to keep the hands warm in the coldest days. The company looks very serious and promising. 3) slightly increase the dimensions of the handwarmers themselves (e.g. from current 9 cm x 5 cm to 11 cm x 7 cm). Working in cold snowy conditions and these hand warmers are a handy size to put in pockets. Keeps the fingers nice and warm! Couldn't face cold - even cool - weather without my handwarmers. A wonderful invention. Your quick service and excellent products are admirable. Very pleased with warmers! Fast delivery - thanks!!! Fast delivery, Great service, perfect product! I take my dogs training a few times a week and always in the winter wear gloves which at times are not adequate enough. These warmers were suggested to me, in fact I was lent some and they did the trick. I like them because they are throw away. Fast delivery, Great service, perfect product! A+++ Seller. Thanx! Really Superb Seller! 4th Item I've purchased and will be coming back for more! Thanks! VERY PLEASED WITH ITEM AND VERY PROMPT DELIVERY!!! Great for cold weather. comfortable temperature after about 10 minutes. Heat lasts 12 hours as adver..
Great for cold weather. comfortable temperature after about 10 minutes. Heat lasts 12 hours as advertised.